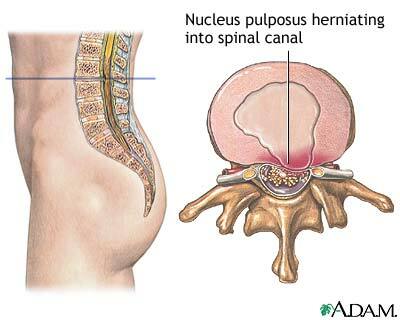 Low back pain is usually caused when a ligament or muscle holding a vertebra in its proper position is strained. Vertebrae are bones that make up the spinal column through which the spinal cord passes. When these muscles or ligaments become weak, the spine loses its stability, resulting in pain. Because nerves reach all parts of the body from the spinal cord, back problems can lead to pain or weakness in almost any part of the body. Back pain accompanied by loss of bladder or bowel control, difficulty in moving your legs, or numbness or tingling in your arms or legs may indicate an injury to your spine and nerves, which requires immediate medical treatment. The pain may be continuous or may occur only in certain positions. It may be aggravated by coughing, sneezing, bending, twisting, or straining during a bowel movement. 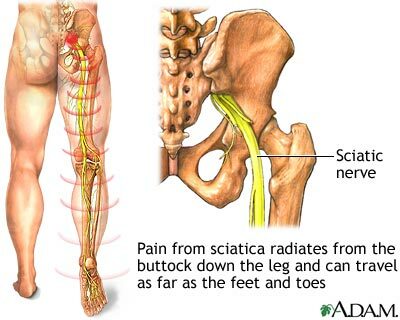 The pain may occur in only one spot or may spread to other areas, most commonly down the buttocks and into the back of the thigh. Your health care provider will review your medical history and examine you. He or she may order x-rays. In certain situations a myelogram, CT scan, or MRI may be ordered. · Using a heating pad or hot water bottle. · Resting in bed on a firm mattress. Often it helps to lie on your back with your knees raised. However, some people prefer to lie on their side with their knees bent. · Taking aspirin, ibuprofen, or other anti-inflammatory medications; muscle relaxants; or other pain medications if recommended by your health care provider. · Having your back massaged by a trained person. · Having traction, if recommended by your provider. · Wearing a belt or corset to support your back. · Talking with a counselor, if your back pain is related to tension caused by emotional problems. · Beginning a program of physical therapy, or exercising on your own. Begin a regular exercise program to gently stretch and strengthen your muscles as soon as you can. Your health care provider or physical therapist can recommend exercises that will not only help you feel better but will strengthen your muscles and help avoid back trouble later. Exercise moderately every day, using stretching and warm- up exercises suggested by your provider or physical therapist. Exercise vigorously for about 30 minutes two or three times a week by walking, swimming, using a stationary bicycle, or doing low-impact aerobics. Participating regularly in an exercise program will not only help your back, it will also help keep you healthier overall. Use an electric heating pad on a low setting (or a hot water bottle wrapped in a towel to avoid burning yourself) for 20 to 30 minutes. Don't let the heating pad get too hot, and don't fall asleep with it. You could get a burn. Try putting an ice pack wrapped in a towel on your back for 20 minutes, one to four times a day. Set an alarm to avoid frostbite from using the ice pack too long. Put a pillow under your knees when you are lying down. Don't push with your arms when you move a heavy object. Turn around and push backwards so the strain is taken by your legs. Lie on your back, put a pillow under your neck, bend your knees to a 90-degree angle, and put your lower legs and feet on a chair.